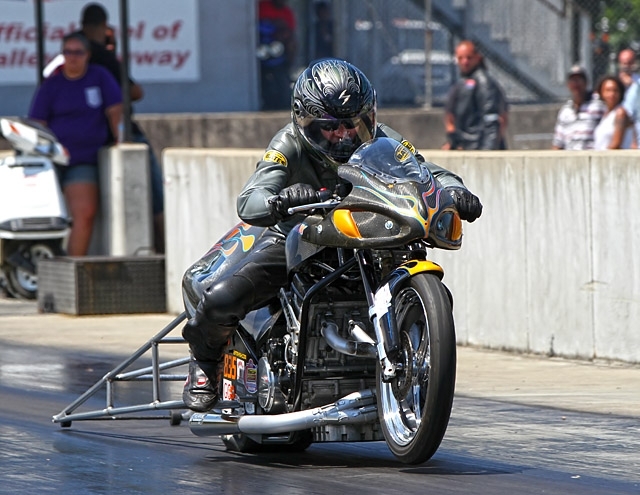 The Midwest’s largest motorcycle drag racing series delivered a strong weekend of pro, sportsman, and grudge action in brilliant sunshine when the NHDRO visited Louisville’s full concrete, eighth mile Ohio Valley Raceway for the Mid Season Sizzle on July 8-10. 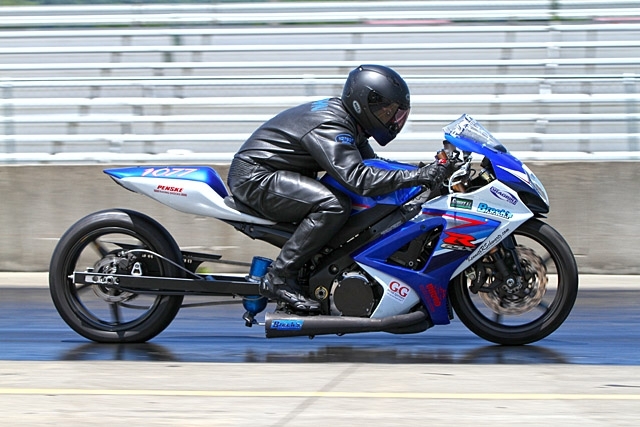 Crossville, Tennessee’s Wes Brown and his GSXR of Renown is the latest racer to double up at an NHDRO event. Brown beat Gateway winner John “Spooky” Markham in the Millennium Trailers Super Comp 5.60 final after taking a slight advantage at the tree. He got off the starting line slightly behind Quinn Orand in the Motorcycle House Crazy 8s final, but ran closer to the number (5.70 on the eighth mile) to take that win as well. Mark Paquette extended his McIntosh Machine & Fabrication Pro Street win streak to three, taking the stripe over surprise finalist Brandon Coley. Paquette said he would tune his turbocharged Suzuki Hayabusa to a 4.60 for the final, and that’s exactly what he ran. Coley’s nitrous ‘Busa slowed on the big end after gaining a slight advantage at the tree. Paquette only qualified fourth, well behind teammate Bud Yoder—the defending Pro Street champion and number 1 qualifier. But Yoder didn’t have the right answer for Paquette’s .004 light and 4.57 in the semifinals. Coley barely escaped round 1 against a hard-charging Rudy Sanzottera and his Quicktime Motorsports turbo ‘Busa. Sanzottera spun early and Coley struggled late. Recovered, Rudy twisted the throttle and took the stripe with a 6.55 at 129 mph to Coley’s 6.57 at 79 mph—nearly slower than a mountain-descending Tour de France bicyclist. The difference was back at the tree—Coley’s .040 to Sanzottera’s .087. Coley then raced past Justin Doucet, who spun, gathered it back up, but came up short in the other semi. Gateway Quicktime Motorsports/Lindeman Performance Pro Ultra 4.60 winner Jeff Lindeman won his second straight when number 1 qualifier Chase Morris redlit by an agonizing .001 on the Fast Times Suzuki. The world’s quickest two wheeled index class had a strong, growing field at Ohio Valley—as it should be everywhere. After briefly letting down his defenses at Gateway, multi-time G&G Metal Spinners Top Gas champ Greg Mallett is back in bounty territory after winning at the ‘Ville. Louisville’s Deshaun Wheeler broke out chasing down Mallett in the final. 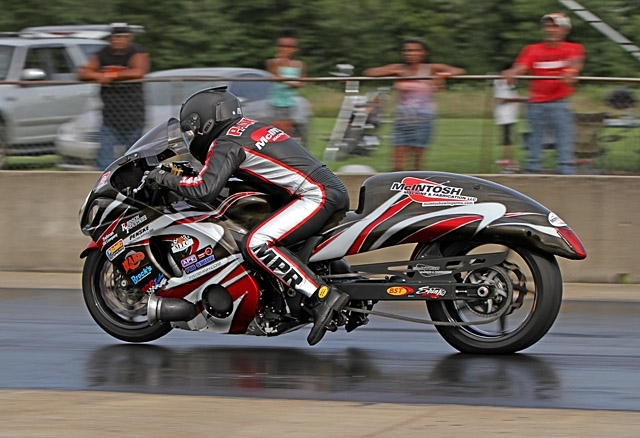 MPS Pro ET wins went to Larry Hunter on Saturday and Eric Cooper on Sunday. Hunter also won at Louisville last year, and beat Joe “Back On” Deck in the final. Cooper’s .016 light put his final round opponent Ronnie Woodall Jr. in a barrel and Eric eased to the win. Elizabethtown’s Danny Miller took a home track win in an all-Fun-For-All-Motorsports sponsored Route 21 Street Fighter final. Bowling Green’s Ron “Jiu-Jitsu” Arnold took the tree but broke out of the 6.15 index by -.007. Arnold already had Saturday’s Kevin Dennis Insurance Street ET win in the bank, taking the final over Stephen Knight. Dustin “Biscuits” Lee took Sunday’s win over Brandon Teasley in a double breakout final. Team DRR gave away Shinko tires to all sportsman number 1 qualifiers. Those lucky guys were Arnold in Crazy 8s, Louisvillian Dino Moran in Top Gas, Hoosier Vince Hileman in Street Fighter, and Tennessean Billy Warren Jr. in Super Comp. The hottest grudge race of the weekend was a 5 stack affair between Jeremy Teasley on the MSP-built “Venom” and “LA” on “DMF” out of Alabama. DMF struggled to hook-up all day and the final was no different, with Teasley taking the win. Despite the best efforts of Chris Cutsinger, Marty “Pops” Sanzottera and Louisville’s Wheeler family, HMH Motorsports Coatings Pro Open did not have enough bikes to race on Sunday. Brian and Niki Welch are excited to see the whole NHDRO family back for a BIG MONEY race on the quarter mile at Lucas Oil Raceway in Brownsburg, Indiana on August 5-7. NHDRO is paying (at least!) a whopping $5,000 to win in MPS Pro ET and $3,000 to win in Kevin Dennis Insurance Street ET, with only a $10 increase in entry fee. Quicktime Motorsports is kicking in a free Shinko to winners and runner-ups in both classes. But wait, there’s more! NHDRO will give free vendor space to any vendor that contributes $250 or more to make these purses even larger. 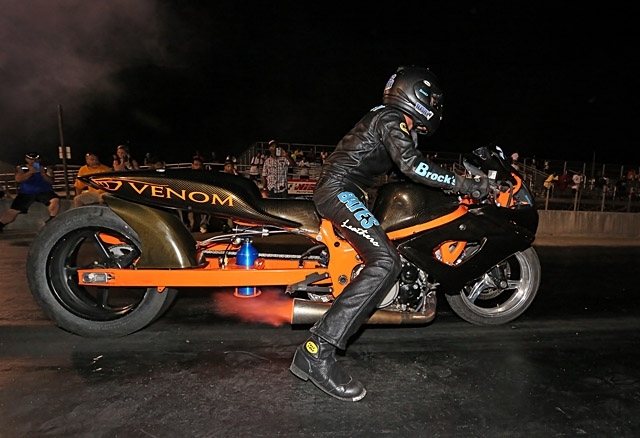 “Let’s shoot for $10,000 and $5,000!” said Brian Welch, who hopes to make these the largest bracket purses in motorcycle drag racing history. Whether racer, vendor or fan, you will not want to miss this historic event! NHDRO thanks McIntosh Machine and Fabrication http://www.mcintoshmachineandfab.com,Quicktime Motorsports http://quicktimebikes.com , Route 21 Racing Apparel http://www.route21.us , Millennium Trailers http://www.milltrailers.com , G&G Metal Spinners http://www.ggmetalspinners.com , Kevin Dennis Insurance http://www.bettercoverages.com , Port-Tech http://www.porttechheads.com/index.html , and HMH Motorsports Coatings https://www.facebook.com/HMH-Motorsports-Coatings-427240650798192/.